Lock in a great price for Worldhotel Wings – rated 8.6 by recent guests! The bedrooms are large and comfortable, and the location perfect for someone flying in late or out early in the day. 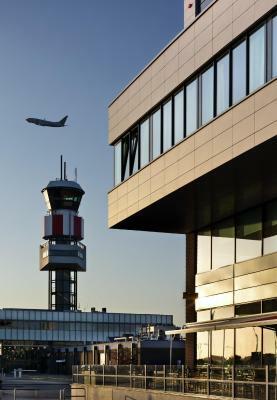 Nice modern hotel, very friendly staff, good facilities and conveniently located outside town at the airport, directly next to the terminal. Good business base for the region. Since we came in late it nice that we could have a drink at the bar.Also vending machines on the room floor. Very good breakfast. 50 meters from the terminal. There is a closed parking garage which we used for the holiday we started here. Same price as regular airport parking, but safer, indoors and closer to terminal. Sports bar was great to relax and have an informal meal. Bar in the middle, seats around it. Great pictures on the walls of fame and TV screens at every with a sports game of your selection. Very friendly service. 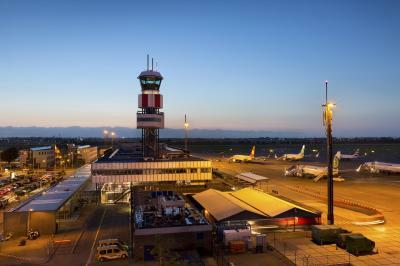 Very dog-friendly and close to departure terminal for Rotterdam Airport. Sleep and park was good value. Very good location, room spacious and comfortable. Restaurant very good, nice staff. Really a recommendable hotel. Worldhotel Wings This rating is a reflection of how the property compares to the industry standard when it comes to price, facilities and services available. It's based on a self-evaluation by the property. Use this rating to help choose your stay! Located at the Rotterdam The Hague Airport, Worldhotel Wings offers hotel rooms with free WiFi access. A restaurant is available on site. 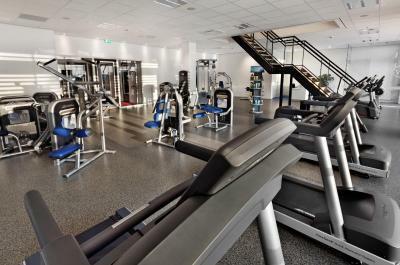 The property is 4.3 mi from the city center of Rotterdam and 5 mi from Ahoy Rotterdam. 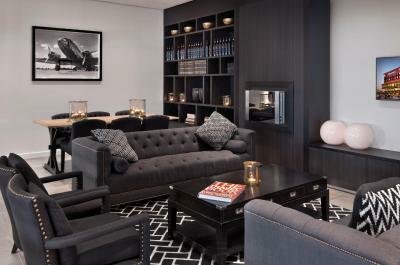 The rooms at Worldhotel Wings feature air conditioning and a seating area. There is also an electric kettle. Featuring a shower, the private bathroom also comes with a hairdryer. Extras include a desk and a laptop safe. At Worldhotel Wings you will find a 24-hour front desk and a terrace. Other facilities like meeting facilities, a shared lounge and luggage storage are offered. Activities that can be enjoyed in the surroundings, include golfing and cycling. If you feel like visiting other cities around, check out Delft which can be reached within a 20-minute car drive. Overschie is a great choice for travelers interested in sightseeing, friendly locals and walking. When would you like to stay at Worldhotel Wings? The standard room is equipped with a 42" flatscreen tv, airconditioning, lounge seat, a bathroom with walk-in shower and a toilet. Also available are a safe and coffee/tea facilities. 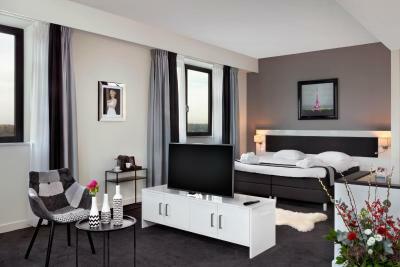 This room is equipped with a 42" flatscreen tv, airconditioning, working desk, bathroom with walk-in shower and toilet. Also available are a safe, a Nespresso machine and ironing facilities. A standard family room with a double bed and a bunk bed. Apart from the 42" flatscreen tv, the bunk beds are also equipped with their own 32" flatscreen. Also available a safe and coffee/tea facilities. 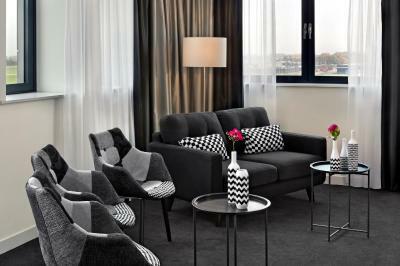 The executive room has a double bed and views over the Rotterdam skyline. 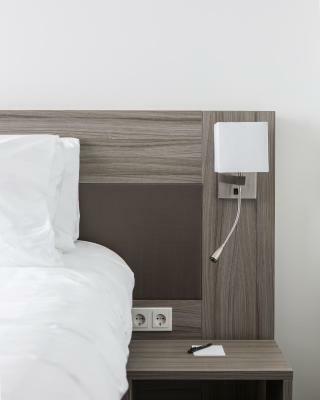 The room has a wide range of amenities such as a Nespresso machine, a working desk and ironing facilities. 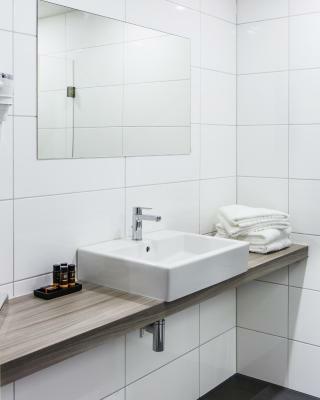 The Junior suite is equipped with a bathroom with bath and walk-in shower. It also offers a lounge area, a stereo installation, a dress boy, a bathrobe with slippers, ironing facilities and a Nespresso machine. The Corner Junior suite is equipped with an open bathroom with bath and walk-in shower. It also offers a meeting room with lounge area, a stereo installation, a dress boy, a bathrobe with slippers and a Nespresso machine. The Senior suite is perfectly suited for our business guests. It offers a bathroom with bath and walk-in shower, a lounge area, a 47" flatscreen tv, a stereo installation, a dress boy, a bathrobe with slippers, a meeting table, ironing facilities and a Nespresso machine. Included is a seperate bedroom, a seating area and an additional toilet. 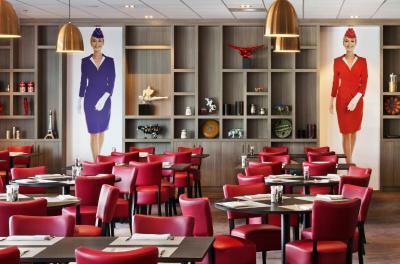 Worldhotel Wings is a brand new hotel in Rotterdam since March 2015. The construction of the hotel took place in a time frame of only 13 months! 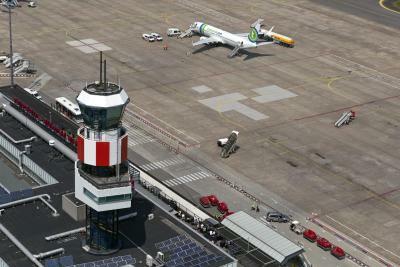 And that on a unique location at only 200 meters from the terminal of Rotterdam The Hague Airport. The whole building consists of six floors, with one flying parking deck. We are called Worldhotel Wings for a reason. We invite you to come in and read a book with a good cup of coffee in the living room, to play some darts in the bar, use the computer in the service center or sleepover in one of our rooms. You are even welcome to stay with us for a long period of time in one of our studios or apartments. And to make it even better, you can enter from the roof by helicopter. 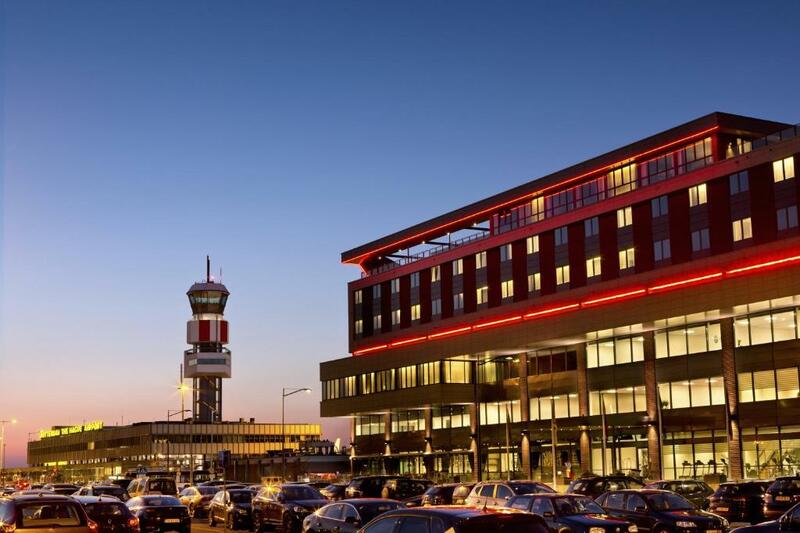 And directly step into the winebar to enjoy a glass of wine and the spectacular view of the skyline of Rotterdam, The Hague, Delft or the runway of the airport. 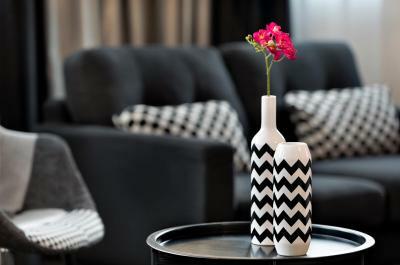 House Rules Worldhotel Wings takes special requests – add in the next step! ATM card Debit card Worldhotel Wings accepts these cards and reserves the right to temporarily hold an amount prior to arrival. Worldhotel Wings accepts these cards and reserves the right to temporarily hold an amount prior to arrival. Lots of high additional costs. Assume 50% extra for a typical stay. the beds are very soft. The bathroom wasn't as clean as expected of a 4 stars hotel. Was smelling like sewage. No shower towels. The temprature of shower water is very unstable, keeping dropping to very cold unexpectedly. Cold, really cold room, especially bathroom, I cannot sleep because of it and strange unpleasant smell in the toilet. 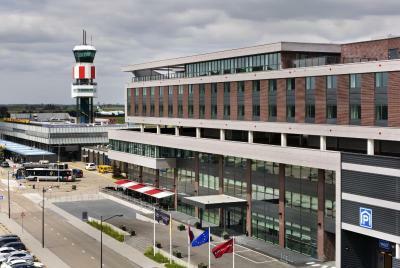 Have stayed here a few times, very convenient for Rotterdam airport which is just a short walk away. Large comfortable room. Hotel is fairly new so everything is clean and fresh. Breakfast is way too expensive for the options provided. Very clean, modern and comfortable. Staff was nice. Brilliant hotel. Large bedroom and bathroom . Comfortable beds . Good location with good public transport link to Rotterdam. Good restaurant , and cosy Sports bar with a good atmosphere. Too bad the shower has poor water supply. Room are very cold , especially bathroom and toilet , it took me several hours to heat up the bed room a bit. had to put towels on the floor in bathroom and toilet to make it a bit comfortable. a reason not to stay again in the hotel although the restaurant, bar and other accommendations are excellent .